Starting January 2004 we will be sending our Newsletter to all our members through e-mail to ensure that programs and news reach our members on time. You will also still be getting our Newsletter in paper form. The tour will be guided by architect Cynthia Ripley. This project involved renovation and expansion of the 1931 library from 30,000sf to 100,000sf. The historic reading room, reference room and children's library were realized in their historic brilliance with new lighting, painted ceiling and restored woodwork. The reading room is 45 feet high with four-story windows that allow the lighted library to be a major feature on an important downtown corner. The new addition provides a new entry, reading and study area with electronic technologies, offices and public meeting rooms. The new design respects the original structure by stepping back, utilizing similar materials and observing the rhythms and proportions of the original building. In addition to increasing the shelf capacity by 40%, the library have increase capacity of their classroom and meeting rooms. Ten of us just returned from our delightful Ecuador trip organized by Gilda Puente-Peters and Marda Stothers. The pace of this trip was leisurely fluid and we managed to covered quite a bit. Gilda had arranged for us to stay at interesting places like old colonial mansions or Haciendas made into boutique hotels. In Quito we stayed at Hostel Santa Barbara and Hotel La Rabida - both have beautifully furnished public parlors and courtyards. Ecuador is very mountainous with deep gorges, waterfalls and volcanoes. What impressed me most was how people built their houses and farms on steep slopes. In Quito, most housing is built on hillsides with wonderful views and the Indian farmers farm their land on a 45 degree slope. One of the highlights of our trip was the visit to Marcello's ranch. Marcello is an old friend of Gilda's. He left his architectural practice to become a gentleman rancher. He has cows to produce milk and green houses to produce roses. To our surprise, he ships his roses weekly to Russia via Amsterdam. To get to his ranch was quite an experience. We had to drive on a narrow rugged twisty dirt road for miles. It did cross our mind that we might not get there! But we did and it was worth every penny of it, because the hacienda was quite special. I particularly loved the forlorn garden with lovely untended trees and flowers - very romantic as if I had walked into another century. Another highlight for me was meeting Gilda's family and friends and spending time with them. They showed me how close families and friends are in Ecuador. It made all of us very envious. Everyone we met on our trip was kind, warm and gentle. The group will be presenting their Ecuador trip in our coming September Retreat. In the early 1970's, the Women's Movement in the United States gained momentum and helped women to become aware of their unequal status in society and pursue change. Women's studies courses at universities, popular magazines like Gloria Steinem's Ms. for Women, and demonstrations for equal rights all caused women to question the validity of male role models and rules in society and to demand equality. The unequal situation of women in the male-dominated field of architecture was brought to light in a long and well-researched article by Ellen Perry Berkeley in the respected architectural magazine, Architectural Forum, in September 1972. The article gave many examples of overt and covert discrimination of women in architecture, landscape architecture and planning, most noticeable in lower pay and less opportunity for promotion than for men. Encouraged by the examples of other women's professional organizations around the country, women architects started to get together in support of each other and to overcome their second-class professional status. In California, some 12 women architects, among them Mui Ho, began informal gatherings in November of 1972 to discuss their experiences at the university and in the workplace. Initially, one-page information sheets, then newsletters, were mailed to potential members announcing the meetings. Among the first speakers was Dolores Hayden, who shared her experience of founding a similar organization for Boston women architects. Members called the group the Organization of Women Architects and developed an organizational structure, drafted by-laws and became incorporated in 1973. Influenced by the women's movement and its emphasis on equality, they chose a horizontal structure. The traditional hierarchical organizational structure of a president, vice president, secretary and treasurer was replaced with a steering committee working cooperatively and making decisions by consensus. The five areas of shared responsibility were Public Relations, Education, Employment, Finance and Newsletter Production. They were originally assigned to two women each with overlapping two-year terms. The goal of OWA is to support women as a whole person and not only their careers. We scheduled meetings with presentations about our own work or other women architects' work, job-sharing, flexible work schedules, and childcare. We organized seminars to review our portfolios necessary for job interviews and to improve our public speaking skills. We arranged financial seminars to learn about money management and health seminars to educate ourselves about women's health and occupational hazards. We also organized field trips to recently completed buildings as well as to construction sites. Many members found new and often better jobs through the OWA job referral service. Our programs vary with the interests and talents of the Steering Committee members. In the mid-eighties, OWA gained much publicity with its House Tours which showcased buildings and landscapes designed by women. The tours were a huge success as people love to visit private homes and gain ideas for their own places. Another important program is the annual weekend retreat at a lovely ranch in the wine country north of San Francisco. Marda Stothers initiated it in 1988 for women in mid-career but it is now valued by all members as a time for renewing friendships, relaxation, reflection and learning about personal and professional issues. Besides providing opportunity for lifelong friendships and career support OWA has created many important programs and actions for the benefit of architects and design professionals in general, not only women. For example, one of our outstanding contributions was the development of the Mock Exam intended to prepare and train young architects for the difficult California State licensing exam. The mock exam was so successful that OWA sold it after some years to the American Institute of Architects. Another significant contribution is providing health insurance to uninsured professionals. In 1976, after lengthy investigations, Janet Crane set up a health plan for OWA members. Making it available to all architects and designers in small offices and unemployed architects is a great service to the community because affordable health insurance is not easily available in the United States. 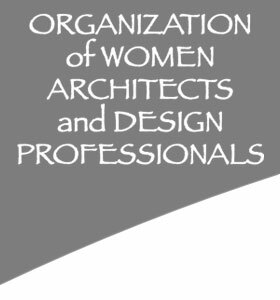 OWA cooperated with many other organizations and institutions and, for example, was instrumental in establishing a new umbrella organization in California which joined forces with several existing women architects' organizations. The goals of this group, called California Women in Environmental Design, were to lobby governmental agencies and provide designing women with public exposure through outstanding statewide conferences and exhibitions of their work. One of the achievements was the development of a new set of design evaluation criteria based on environmental and human values. Naturally, over the years, OWA grew into a mature organization with a membership ranging from students to active practitioners and retired professionals. In response to a changing society and architectural practice, OWA varies the services it offers to its members. OWA proudly looks back on its 30 years of successfully promoting and furthering women in architecture and related design professions and confidently looks forward to many more years of active involvement in issues concerning women's advancement in design. Profiles of our speakers are published in our Nov/Dec 2002 Newsletter. Part 1 addresses the impacts that under-represented scholars, writers, and critics have had on scholarship and scholarly activism about architectural and design-related issues. 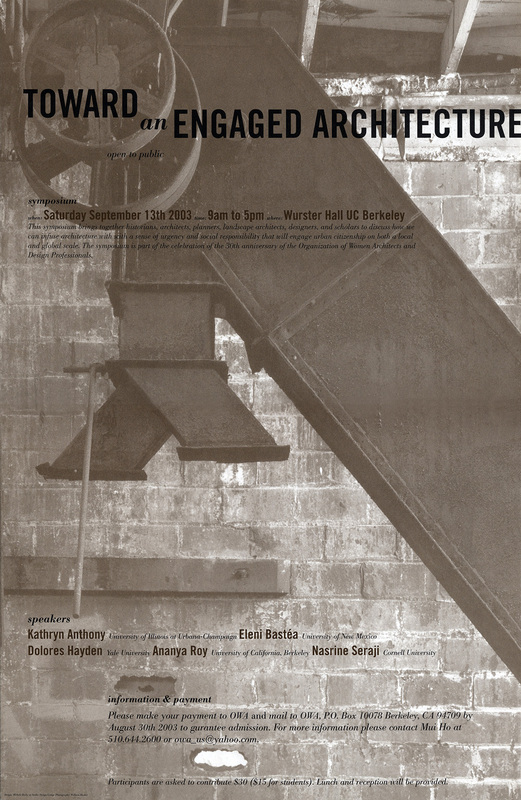 A brief overview of key works will be presented. The issue of potty parity will be highlighted. It provides an unusual example of how an awareness of gender issues in design has helped to change laws in several states. Part 2 addresses the impacts that under-represented architects have had on the public. A call was sent to members of the electronic list-serves of the following groups: 1) the American Institute of Architects Diversity Committee, 2) the National Organization of Minority Architects, and 3) Chicago Women in Architecture. Members were asked to comment on the following question: What kinds of impacts have you made on specific design projects--impacts that would not have been possible had you or another person like you (i.e. woman, person of color, other diverse designer) not been on the design team? How/why were you especially able to address specific needs of users--in a way that someone else could not? Where was the project, who was it for, and who are you? Specificcases will be highlighted. To date, these include: Debbie Kent at Pam Hutter and Associates, an architectural firm in Chicago; Patricia Saldana Natke, owner of Urban Works, another architectural firm in Chicago; and Paul Taylor of African Architecture, former university architect at the University of Maryland at College Park. For almost two centuries, Americans have chosen to live in suburbs marketed around the triple dream of single-family housing, nature, and community. Developers' efforts to transform farmers' fields into millions of wooden houses set in leafy yards have created metropolitan sprawl that can be sorted into seven historic patterns. Borderlands settled by individual families began in the 1820's, while landscape architects began to design picturesque enclaves in the 1850's. Streetcar buildouts for people of modest incomes flourished in the 1870's; mail-order and self-built suburbs grew around 1900. Real estate interests persuaded the federal government to subsidize vast sitcom suburbs in the 1940's. In the 1960's, federal subsidies for highways, malls, and commercial real estate stimulated edge nodes. Workers in edge nodes then commuted to rural fringes starting in the 1980's. Through times of boom and bust, the scale of American suburban development has increased, so that by 2000 suburban fabric replaced many older downtowns. Architects, landscape architects, and planners have suggested that neo-traditional towns, advances in digital technology, “smart growth," and “green building" can solve the problems of suburbs through better new construction in suburban locations. Instead, the reconstruction of suburbs requires a new kinds of political and economic commitment, as well as physical programs designed to engage seven historic suburban landscapes. The 21st century started with great hope, with hope that it would be an opportunity for the renewal of our tired planet, for a just reconciliation of the conflicts of the 20th century, for the rise of an energetic civil society the world over. And yet, just a few years into this century it has become clear that we are faced with a quite different global order: Empire. If in the 1990's, there was great trepidation about the economic inequalities and political disempowerment being wrought by corporate globalization, then now such concerns are intensified by America's imperial ambitions. Today's global order is marked by a paradox: on the one hand, America has engaged the world through a "war on terror" and on the other hand, it has systematically disengaged from all international institutions that create global cooperation and accountability. Much of the recent talk around planning and architecture has been about "rebuilding": rebuilding the towers, rebuilding Afghanistan. But this bypasses crucial questions: who is rebuilding and for whom? According to what priorities? Is this an opportunity to do things differently, as various intellectuals have stated in their vision for a "democratic" rebuilding process in New York? Or is this business as usual? It is a sobering thought to ponder the role of architecture and planning in the time of empire. But I argue that it is also a time of opportunity. This opportunity is not that of "rebuilding." Rather it is the opportunity to enact change in our disciplines, pedagogies, and professions. There are three calls for change that I outline in this paper. Planners and architects could be similarly inspired to imagine and implement a different global order.